HTC's Florient Seiche confirmed the HTC Flyer will go on sale from 9 May across Europe. 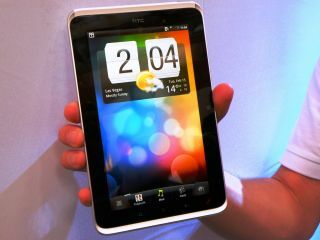 The HTC Flyer tablet has been given a pre-order price of £599.99 from The Carphone Warehouse, helping to put to bed rumours of a delay. There were rumblings that the new tablet would be pushed back a few months to incorporate Android 3.0, something HTC has strenuously denied. And while TCW hasn't managed to be all helpful and delivered an exact HTC Flyer UK release date, early May 2011 is a pretty good indication that there won't be a delay on the tablet. The £600 price tag is for the 3G and Wi-Fi version of the Flyer, with a cheaper Wi-Fi only option set to land in the near future. However, for a 7-inch screened, single core device, it's a pretty hefty mark-up from the larger iPad 2, although you don't get a free electronic pen and Flash video support from the Apple device. With the tablet wars hotting up faster than an ant under a mean child's magnifying glass, it will be interesting to see if a smaller screen and a few extra specs will be enough to halt the public lust for Apple's latest gadget.